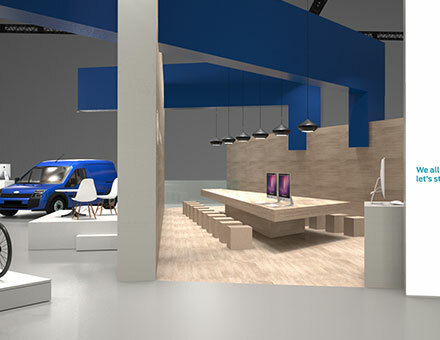 Fair booth design presenting Ford Smart Mobility at the Mobile World Congress, the world’s biggest global mobile fair. 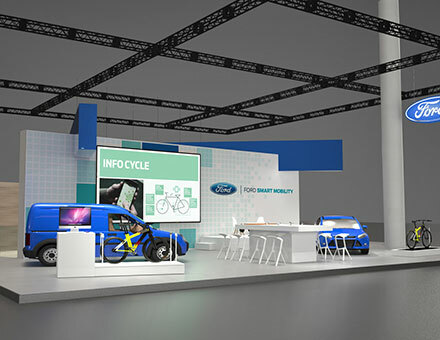 Ford is a technology leader that uses innovation to enable new modes of transportation by leveraging connectivity to create affordable, accessible solutions that help solve future mobility challenges. 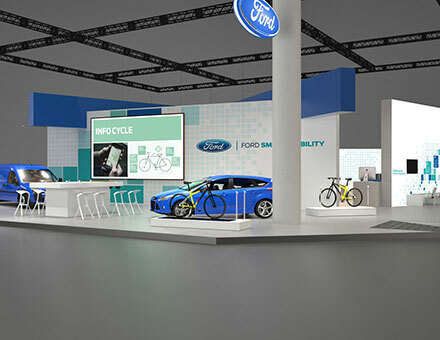 The Ford stand presented global mobility experiments that include car-sharing and shuttle buses, and revealed the latest apps Ford is integrating with the cars. Handle on Mobility explores how e-bikes could connect with an app, public and private transport. The design concept communicates Accessible Technology. An open entrance to the media hospitality area shows Ford’s accessibility and collaborative approach. A light and bright space to collaborate, get inspired and meet with fellow creative problemsolvers. 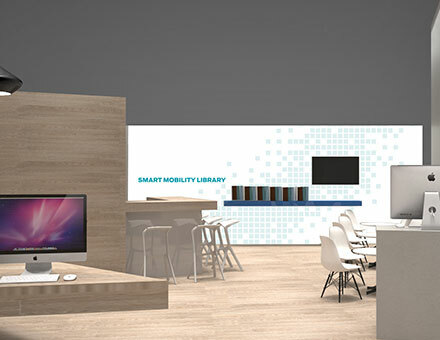 Apps, demos and workshops are held in the center of the stand, inviting hands-on interaction. Materials are warm and bright, Ford blue beams connect all parts of the mobility story of Ford‘s Connected Journey.